What do you do when you need to add analytics to your server? Well, Google Analytics is a good option, for sure, but it doesn’t capture important, juicy details like bandwidth usage, time to complete requests, cache-hits and so on. If you need data like this, the best source is going to be the web access logs from your HTTP server. I’ve taken a look at a few 3rd party tools for creating analytics from these log files, and there are downsides to every one of them. Cacti is a pretty good option, however it requires a few things that may not be installed on a Windows server (i.e. PHP, MySQL, RRDTool, and net-snmp). So, based on the fact that most existing solutions aren’t designed to fit seamlessly into a windows environment, I decided to come up with my own solution. So, what is the secret sauce? Well, SQL Server’s ADO.NET provider exposes the SQL Server Bulk Import API through a class called SqlBulkCopy. We can easily craft a C# program to take the clean, consistent output of Log Parser and stream it into SQL Server at breakneck speeds. set logparser="C:\Program Files\Log Parser 2.2\LogParser.exe"
%logparser% "SELECT * INTO log-w3svc%siteid%-ex%logdate%.csv FROM C:\WINDOWS\system32\LogFiles\W3SVC%siteid%\ex%logdate%.log"
If you run that, you should end up with a CSV file in the current directory, with the current day’s logs for the default IIS website. It also accepts the website ID number as a parameter on the command line, if you want to run this for more than one site. Now, here I would like to note that Log Parser supports a mode of operation in which it remembers where it left off in a log file, and skips there on subsequent runs. However, I have found that, since IIS does not flush its log files and since Windows caches writes, the log will sometimes end half-way through an entry. When a situation like this arises, Log Parser gets confused and completely fails to properly parse any further entries. In addition, its SQL support is useful but is unable to do the incremental loads that we would like to do. We need a place to shove that data, but we have two masters to server at this point. On one hand, we want to transfer as little data to the database server as possible, for obvious reasons. On the other, we don’t want to have long-running transactions against the main IIS logs table, since it is really made for OLAP and response time of queries is paramount. This all leans toward a scheme of staging and merging data, rather than cherry-picking new rows to import. And, even though we don’t want to transfer tons of data, we should be OK with 1-day’s-worth in a staging table. After the data is staged, it can be incrementally moved into the main storage table to reduce the impact on the analytics. The staging table will be an almost identical temp table, with the single omission of the computed ‘datetime’ column. So, now it is time to explore the power of the SqlBulkImporter class. This code is available on GitHub, so there is no need to follow along unless you are building a custom version. In light of this, I will be skimming over a few of the easier parts. The little example above is fine-and-dandy for reading the data into memory, but just for the sake of future-proofing, we should aim to stream the data in. This will ensure that we can import successfully, even during extreme loads. Rather than using a DataAdapter and DataTable, we will opt to read the rows and columns ourselves with the ExecuteReader family of methods. There are only two noteworthy bits: the bulk import itself and the merge operation. The SqlBulkCopy class can be given options to create an internal transaction, fire (or bypass) triggers, fire (or bypass) check constraints, insert into identity columns, and etc. Bulk SQL operations can enter into external transaction, and can be rolled back in the same way that any transaction can. 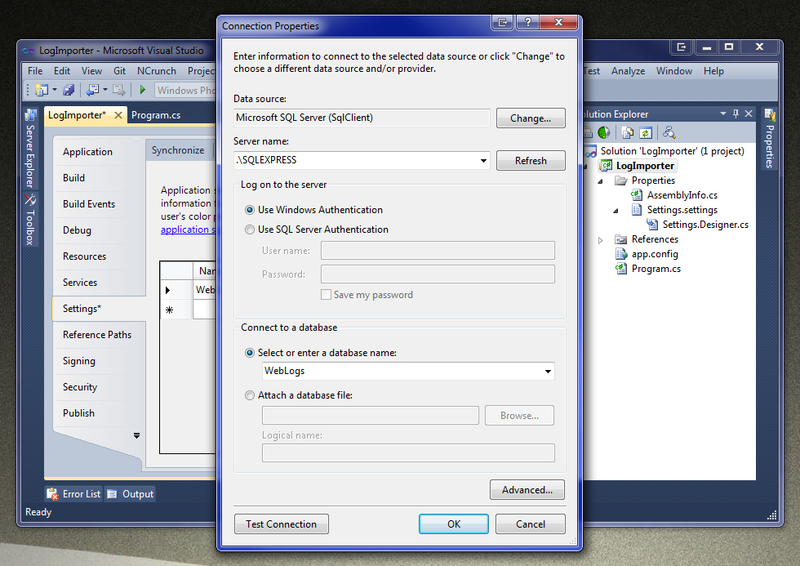 I was expecting this, but was still pleasantly surprised to find that SQL Server inherently supports this. SQL Bulk Copy operations use an ordinal column mapping by default. This means that columns are mapped based on their position in the import data and in the table rather than their names. This can be overridden by mapping each column pair by some combination of ordinal position and column name. Here, we are using a simple name-to-name mapping. Bulk operations can be performed against temp tables. I was not expecting this to work, and was again pleasantly surprised. The SqlBulkCopy class can use either a set of DataRows (from a DataTable, for example) or an IDataReader as its source. 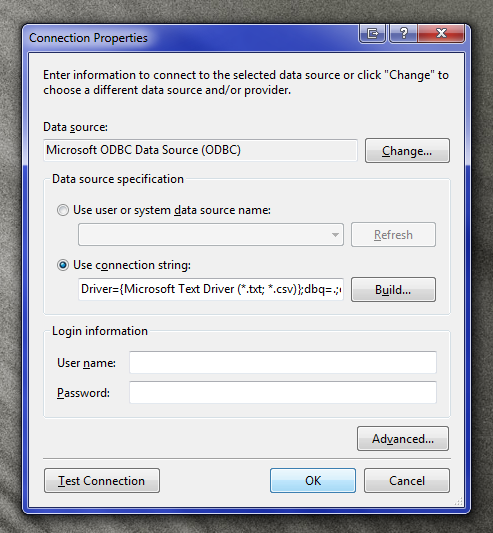 The final notable part of the program is the merge operation. There are several ways to get this done; from a single, complex insert statement, to individual insert operations. We will be aiming for a set-based approach, utilizing joins to do most of the heavy lifting. This uses the SQL Server Window Function ROW_NUMBER() to determine individual rows to delete. 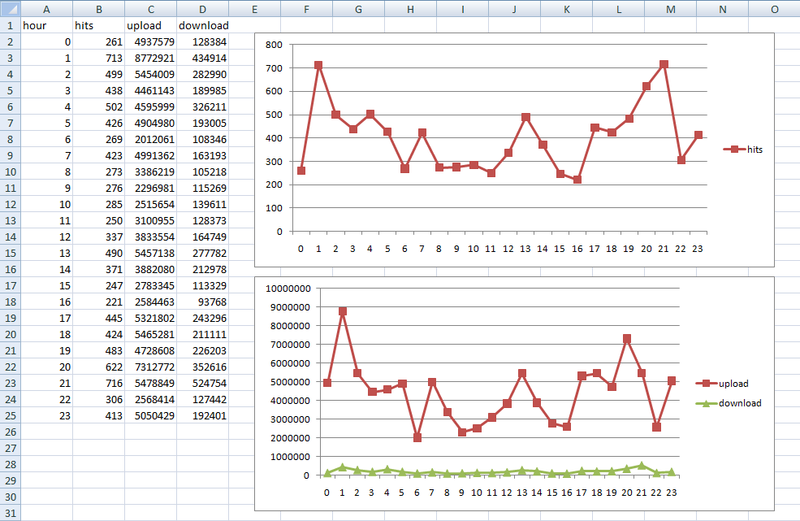 Let’s get a simple graph showing the last 3 day’s hits, upload, and download, grouped into hourly buckets. I have included many more queries to play with in the project on GitHub. Stay tuned for more!